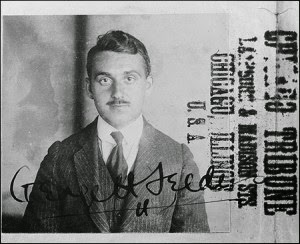 George Seldes has been called every name in the book: scoundrel, troublemaker, Red. Sometimes he was called nothing at all. He swears that for 40 years his name never soiled the pages of The New York Times - and that was worse. But Seldes outlasted every one of his critics and, at 97, is at work on his 22nd book. The recent publication of his memoir, Witness to a Century, even earned him a review in the Times. It was, of course, unfavourable. Seldes has come to expect such treatment. 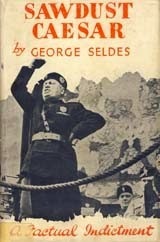 He was kicked out of revolutionary Russia by Trotsky, and banished from Italy by Mussolini. He fared little better at home, where his vociferous criticisms of the tobacco and newspaper industries led them to vilify his name. For years no publisher would touch his work, and Seldes seemed destined to live out his life embittered and forgotten in a farmhouse in the Green Mountains of Vermont. But after Warren Beatty interviewed him as one of his "witnesses" in the 1981 movie Reds, Seldes became the subject of newspaper and magazine profiles. Abigail van Buren, who writes the syndicated newspaper column Dear Abby, urged her readers to buy his books. The old muckraker has lived long enough to see his reputation rehabilitated in his lifetime. "At 90, all your sins are forgiven," says Seldes, who won a prestigious George Polk award for journalism six years ago. "I'm pushing 98. It's a little late for all this recognition and all this cash." Ballantine Books will publish his current effort, which is tentatively titled To Hell With the Joys of Old Age. It opens with the sentence: "Retirement is the dirtiest 10-letter word in the English language." Seldes, who has been a reporter for almost 80 years, is press critic and gadfly rolled into one. He led the way for both A.J. Liebling and I.F. Stone, who acknowledges his debt by calling Seldes "the granddaddy of us investigative reporters." Seldes lives in a book-lined farmhouse in Hartland-4-Corners, where he pecks at the same 50-year-old typewriter he has used to write his last dozen books. On one wall hangs a portrait of Seldes done on the streets of Paris for a modest 10 francs. The artist was a yet undiscovered Alexander Calder. Seldes says he owes his remarkable career to one simple ethic: Let the facts speak for themselves. "I was trained that news is news no matter where it originates," he says. Seldes was born in a Utopian colony founded by his father in New Jersey. The Russian writer Maxim Gorky was an early visitor, and the first of an impressive line of personages that Seldes would meet. He also recalls reading letters his father got from Prince Kropotkin, the anarchist, and Tolstoy. He was hired as a cub reporter by the Pittsburgh Leader for $3.50 a week in 1909. The teen-ager soon won a front-page story when the politician William Jennings Bryan, clad in a one-piece suit of woolly underwear, evicted the pup from his hotel room for the impertinence of his questioning. He interviewed Teddy Roosevelt and steel tycoon Andrew Mellon, but lost his reporting job after Rev. Billy Sunday visited Pittsburgh during a revivalist campaign. Seldes wrote that when Sunday called on sinners to come forward to repent, the first to do so were frauds paid to lure others from the crowd. He was a war correspondent during the First World War and was later hired by the Chicago Tribune foreign news service. His beat stretched from Berlin to Baghdad, he liked to say, and he covered Balkan kings and Baltic presidents. He was with Woodrow Wilson during the making of the Treaty of Versailles, knew Douglas MacArthur when he was still a colonel, and interviewed Hindenburg and Lenin. He met Hitler at a party in 1925 and found him insignificant. Seldes covered the Spanish Civil War for the New York Post, and with his wife stayed in the same small hotel that housed Ernest Hemingway, who, though he fought with Seldes, called him "a damn fine newspaperman." Seldes counted Theodore Dreiser among his cronies, and Sinclair Lewis bought him his first home in Vermont. "Hemingway, Lewis, Dreiser, every one of them was a genuine newspaperman," Seldes said. "They became reporters not because they looked at it as a stepping stone to becoming novelists. They intended to make it their life's business, but something always stepped in and they went out." Seldes briefly tried his hand at fiction, but declared his work a disaster and returned to what he felt so comfortable compiling - facts. Near the end of the Depression, Seldes and Hemingway were hired by Esquire magazine editor Arnold Gingrich to write columns for a new publication to be called Ken. "Ken magazine was one of the greatest disappointments of my life," Seldes says. "We would have had millions backing us in a big, illustrated publication like Life or Look. It was going to be called Ken: One Step Left of Centre. And the advertising agencies said, 'one step left of centre and you don't get one page of advertising.' And that killed it." Soon after, Seldes founded his own magazine, a four-page weekly. It was to be a journal of press criticism and he called it In Fact: An Antidote for Falsehood in the Daily Press. For a reporter who began his career during the final days of the muckraking era, the newsletter cast a much- needed spotlight on an industry too long free of criticism. "You can't imagine the days when you could buy the editorial policy of any paper in Pittsburgh for a $2-an-inch ad," he says. "Things like that don't happen any more." In Fact was launched with $1,500 raised by 6,000 labor subscriptions at 25 cents each. Seldes wrote every word, but he was aided by about 200 reporters working for daily newspapers who sent him stories they could not get published. In Fact's circulation grew to 100,000, before dropping to 57,000 in 1950 after a 10-year run. Seldes is credited with being the first reporter to document in print the link between tobacco and cancer as revealed by research at Johns Hopkins Hospital in 1938. "That was suppressed by every newspaper in the United States," he says, his indignation years after the fact seemingly as fresh as it was that day. "Not a newspaper would touch it." Seldes has long railed against newspaper owners who in his eyes betrayed the public's health because they feared losing advertising revenue from cigaret companies. The matter infuriates him still. For Seldes, the good fight will end when he does. Jes Vowles shows off a Hermes portable. Photo by Deddeda White. This column originally appeared in the Globe and Mail eight years ago. It is being reposted on the sad occasion of the closing of Type'n Write, the last store of its kind on southern Vancouver Island. The machines rest in tidy rows, silent slaves awaiting the touch of a master. Most require electricity, yet a handful need only the thick-fingered thumping of well-aimed digits. On any given day, customers enter Type'n Write and do just that. They flick on a switch, or simply begin hammering. "Now is the time for all good men. . . ." Or, "The quick brown fox jumped. . . ."
Errors are quickly, if untidily, dismissed by a row of XXXXXXXs. The other day a feeble woman of advanced age braced herself before an IBM Selectric. Switched on, the machine purred. She rubbed her fingertips across the keys. Soon, the shop was filled with a staccato rhythm, stiff fingers repeating old familiar patterns. To those of a certain age, the noise is the sound of a novel being composed, or a newspaper article being hammered out on deadline. It is the sound of work being done. The typewriter is a 19th-century innovation overshadowed by a 21st-century communications revolution. It creates snail mail in an age of e-mail, making it the buggy whip of office machines. Yet the old beasts have a romance to them. Those who persist in using clunky typewriters instead of a pocket BlackBerry regard their machines as a trusted friend, a companion for the most intimate confessions. Toss it on the rubbish heap for gadgetry? Impossible. Type'n Write remains a refuge for those who prefer the old ways. 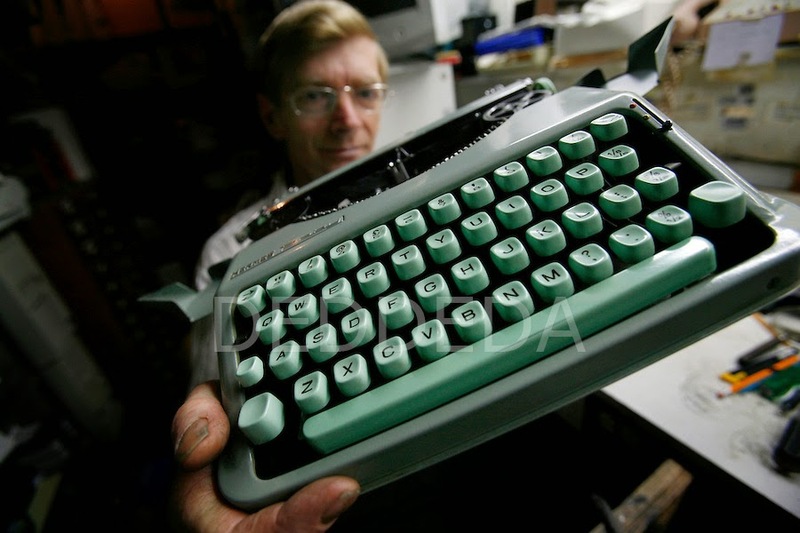 When owner Jes Vowles bought the business a quarter-century ago, the store was one of a dozen offering typewriter repairs. Today, his is the one of the last two listed in Victoria's Yellow Pages. On average, a machine arrives for repairs every other day. Some weeks, a dozen will be stacked awaiting Mr. Vowles's restorative touch. Tourists passing through town drop their machines off at the store, then pick them up on their way home. Other machines arrive by courier. The philosophy of the city's last typewriter doctor is a simple one: "Just do 'em. Get 'em done. On to the next one." At 52, Mr. Vowles has spent half his life squinting at the bowels of most every model of typewriter. The son of a carpenter, he worked as an auto body mechanic before buying his own shop on Quadra Street, north of Hillside. He is a shy, soft-spoken man whose workplace is full of the tools of a fading trade. A crowded drawer holds files, brushes, screwdrivers and torque pliers. A vise and air gun share space on a workbench on which tools rest against forgotten cups of cold coffee. He is surrounded by boxes of parts and a library of repair manuals. A nearby shelf holds cans of WD-40 and Brasso. A magnifying glass is within reach, as is a bottle of Windex. He can take apart a machine with the light touch of a surgeon, yet most of his repairs are more mundane. The typewriter has a No. 1 enemy: "Dirt," he says. "Things get sticky. You get the odd part that breaks. Sometimes you have to file things to get them to work. Usually, though, it's dirt." Gunk accumulates underneath the machine, where dust and grease create a sludge that sometimes gums up the works. Hands that work on typewriters seem to defy cleanliness, as anyone who has ever replaced a ribbon knows. In the front of the shop, shelves groan under the weight of used machines for sale. The brand names are a challenge to even the most adept typist -- the Xerox 6010, Canon AP100, Sharp PA-3000II, Brother AX-400, Olivetti ET110, Underwood 5500, Panasonic KX-E4020, Smith-Corona XD 5900, Sears Correct-O-Ball XL-I. They describe themselves as "memorywriters" and "personal word processors." One boasts a "Spell-Right Dictionary." Each must have seemed like a gift from the Jetsons when they arrived in an office; yet all were soon made obsolete by the computer boom. From cutting-edge technology to museum piece, in the space of a generation. Type'n Write has for sale a few manual typewriters, including a sleek, Swiss-made Hermes Baby portable and an Olympia Monica with a standard QWERTY keyboard supplemented by exotic Polish diacritics such as the kreska, ogonek and superior dot. The shop can also be a magnet for typewriter aficionados on a quest to replace parts. (A box of metal printwheels for Wang Printers awaits what no doubt will some day be a most gratified and surprised customer.) The store's south wall is filled with dusty boxes of hard-to-find stationery supplies, including pen nibs, Ko-Rec-Type ribbons, and a rainbow assortment of Liquid Paper, including the elusive goldenrod. Typewriter people come through the door full of apologies for relying on old technology. Here, they are among those who understand the appeal of the clack of metal heads striking silk ribbon and paper rolled on a rubber platen, not to mention the satisfying ding of a bell announcing the end of another line of prose. "They don't think anyone's around to work on them any more," Mr. Vowles says. "They're surprised. And glad." These may be the last of the typewriter people. Smith Corona, which once rolled off the tongue as a synonym for typewriter, has already lost its familiarity. "I get people calling asking for Smith & Wesson ribbon," says Jo Miles, who handles customers while Mr. Vowles performs his wonders. "No one has asked for bullets yet, thank God." The shop even sold atypewriter last week. Why would anyone buy a typewriter in the age of wireless laptops capable of accessing the world's accumulated knowledge with a few keystrokes? "NEWAC," Ms. Miles replies succinctly. "Not Everybody Wants a Computer."